Have you ever dreamed of having your own show? There is no easier way to build a platform quickly. To learn more about what goes into starting your own show, this episode of the Social Media Marketing podcast goes deep on the subject. In this episode, you’ll learn the different formats involved in both audio and video shows and the key ingredients you must have to make it a success. There are some amazing talk show hosts who do incredible things by simply talking to other people. Think about Jay Leno, Howard Stern, Dr. Phil, Ellen DeGeneres and Oprah Winfrey. Oprah Winfrey started out with a half-hour, low-rated talk show in Chicago, and look at her now. The secret to her success is interviewing people. In the social media world, the big name that comes to mind is Gary Vaynerchuk. He became famous for Wine Library TV. He sat behind a camera in his wine library store and he talked about wine. He also had interesting guests who talked to him about wine. Gary has a really cool personality, which led to incredible opportunities for him. As a result of him simply talking about wine, he got a $1 million book contract. If you think of the podcasters you listen to regularly, many of them have shows where there is more than one person and there is dialogue going back and forth. The secret source of everything I’ve ever done is interviews. Interviews have been the key to Social Media Examiner’s growth. When I launched Social Media Examiner in October 2009, I took my friend Jeff, who’s a video guy, to BlogWorld. And when I went to a MarketingProfs conference in Chicago, I took my flip camera and interviewed people. I got behind the camera and talked to the likes of Chris Brogan, Steve Rubel, Jessie Stay and a lot of other people for about 10 minutes each. These interviews catapulted Social Media Examiner to incredible success. Interviews weren’t the reason for all the success, but they were extremely instrumental. 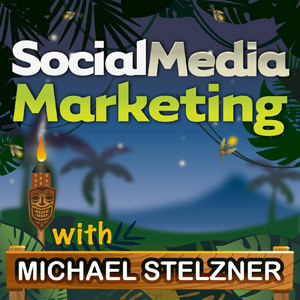 Listen to the show to find out why interviews are one of the reasons for Social Media Examiner’s success. I never liked reading books in college, so to be able to pass tests, I had to arrange study groups with some of the smartest kids in class. By hosting the study group, I would learn enough to be able to ask questions to get the dialogue going. From this experience, I discovered that I could learn something by interviewing people in my group. These techniques led to my future success. One of my first companies was Stelzner Consulting. I was a writer for high-tech companies, where I interviewed engineers on the factory floors. It was my job to write materials to help the organization sell. 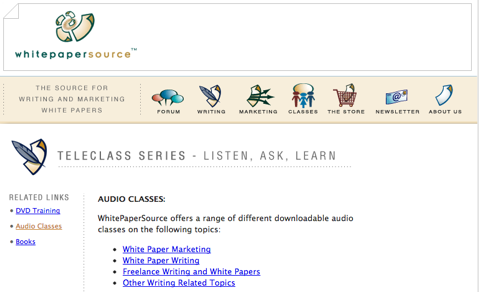 Before Social Media Examiner, I was known for writing white papers and I did a lot of teaching. In the early 2000s, I ran teleclasses, where 100-200 people would pay $39 to $59 to listen to me on the phone interviewing experts every month. Before Social Media Examiner, I was known for teaching classes about writing white papers. Listen to the show to learn how you could become the next Gary Vaynerchuk or Oprah Winfrey. A great example is Derek Halpern of Social Triggers, who goes out of his way to reach out to scientists who do really interesting psychological research. The knowledge that Derek extracts from them is really exciting. Everyone who isn’t a scientist thinks Derek is brilliant. He is associating himself with some really brilliant people. The other benefits of doing interviews is that it’s fun and easy. It’s much easier for two people having a dialogue to create incredible content. An extended monologue is a lot harder to prepare. As a content marketer, interviews can help attract an audience for your business. You can also build valuable relationships that would be impossible otherwise. Listen to the show to discover further benefits of doing interviews. There are two types of show formats. The extended monologue and the talk show. A great example of someone who does an extended monologue show is Michael Hyatt. He has a podcast called This Is Your Life, which regularly trends in the top 10 marketing podcasts. Michael shares great content from his experiences. He’s all about intentional leadership. Using previous content gives Michael a bit of direction, although he has revealed to me that he finds the monologue format hard to do. Doing an extended monologue is like giving a presentation. You need a really detailed outline and it takes a lot of work. 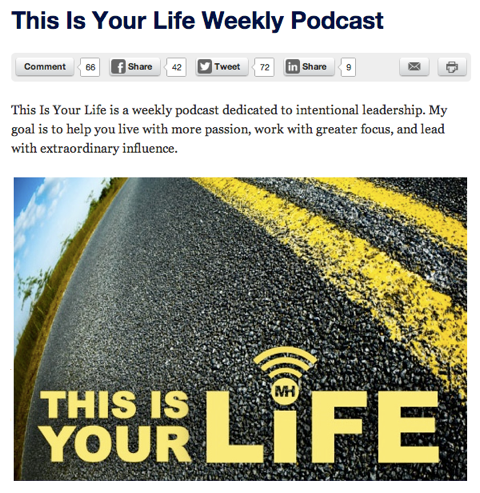 Michael Hyatt's extended monologue show, This Is Your Life. The talk show format is a lot easier. It’s about multiple people having intelligent discussions. 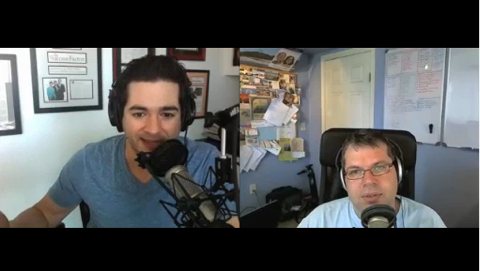 A great example of someone who’s doing a talk show in a video format is David Siteman Garland, on The Rise to the Top. In the show, David interviews experts and you see both David and the expert sitting side by side on a video cam. Michael Siteman Garland's video show, The Rise to the Top. 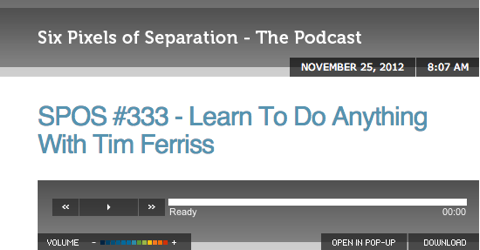 A great example of a talk show in an audio format is Mitch Joel‘s podcast 6 Pixels of Separation. Mitch has a brilliant style of discussion. Click on the image above to hear Mitch's interview technique. Listen to the show to find out why Mike is a big fan of the talk show format. Do you have what it takes to do your own show? Are you a naturally inquisitive person? Then you have what it takes to a host a show. You don’t have to be an expert speaker when you do interviews, because you just have to ask questions, step away and let the interviewee do the talking. Listen to the show to hear why being a naturally inquisitive person is a bonus for hosting a show. You’ll find that having a path mapped out before you start the interview is critical. Not only does it keep you and the expert on topic, but it also helps create a show that will engage people and keep them listening. I put together a cheat sheet. It’s simply a small document that I have either on a card (when on the go) or on my screen (when online). The value of the cheat sheet is to have a line of questions ready to ask. You could try to be like David Letterman and look out for people who want to promote their new book or new products in your industry. These people are looking to promote what they have and once you can get them on your show, as long as you talk about what they are there to talk about at some point, you can still take them in any direction you want. This way you can get some of the best guests on your show. Video interviews are further broken down into in-person and remote. One example is if you are going to do an in-person interview, you can do it with your iPhone or a flip camera with a tiny tripod, or at a desk inside a trade show event. You can also bring a camera crew with you. In the beginning, I recommend you keep it simple and use a small portable video device to get a few videos (that you don’t appear in) under your belt. You’re behind the camera, but your voice is being heard. Then there is the remote type of video. For example, you can use Skype or GoToMeeting. Either one works well. You can record the video on your computer using Call Recorder on Skype, Camtasia on Windows or use ScreenFlow on the Mac. Audio is the easiest to do because you don’t have to worry about what you look like on camera. You can use call bridges like Free Conference Call, AccuConference or Skype. Simply record the audio. Use the simple tips below and you’ll have a cool show. Be sure to think about the questions you want to ask in advance and try to come up with a theme. If you don’t have a theme, your questions will end up all over the place and you’ll have a hard time marketing the show. Make sure you run the bio by the person before you start recording. This gives the interviewee the chance to be introduced correctly. Explain who your target audience is to the person you are interviewing, as this helps them think about how to answer your questions. Confirm that they have the amount of time that you want them to have for the interview. Ask them to shut off all distractions. Listen to the show for more useful tips. If you are looking for some cool sounds to add to your podcast, then head over to FreeSound. It’s a search engine for sound effects. Click on the image above to hear an example of what is available on FreeSound. Listen to the show to hear some examples and let us know if you give it a try. Listen to Mitch Joel‘s podcast called 6 Pixels of Separation for a good example of an audio talk show. What do you think? What are your thoughts on starting your own show? Please leave your comments below.